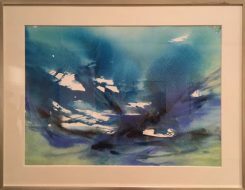 To be held every three years, the Splash: McClelland Contemporary Watercolour Award has been established to showcase contemporary Australian watercolour practice. It is an acquisitive award enabled by the Fornari Bequest by the Will of the late Lena May Fornari, and is a legacy of her support of the arts in Victoria. Lena May was an ardent collector of watercolours and the first acquisitions through this bequest were significant watercolour paintings. Continuing this tradition, Splash presents the work of contemporary Australian artists who use this medium in highly accomplished and innovative ways. 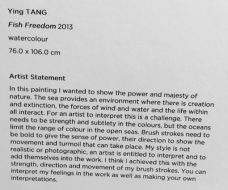 MSWPS Member Tang Ying’s watercolour Fish Freedom is one of the finalists in the show.